Imagine an electric car in a country where most energy come from coal (which i believe is the dirtiest). Add this to the pollution that disposing the batteries will create, or the carbon footprint generated during its production. Is this car really beneficial in terms of carbon emission and pollution compared to a modern petrol or diesel engine car? Both of these conclude that electric vehicles produce lower greenhouse gas emissions than conventional vehicles using California or US electric mix. 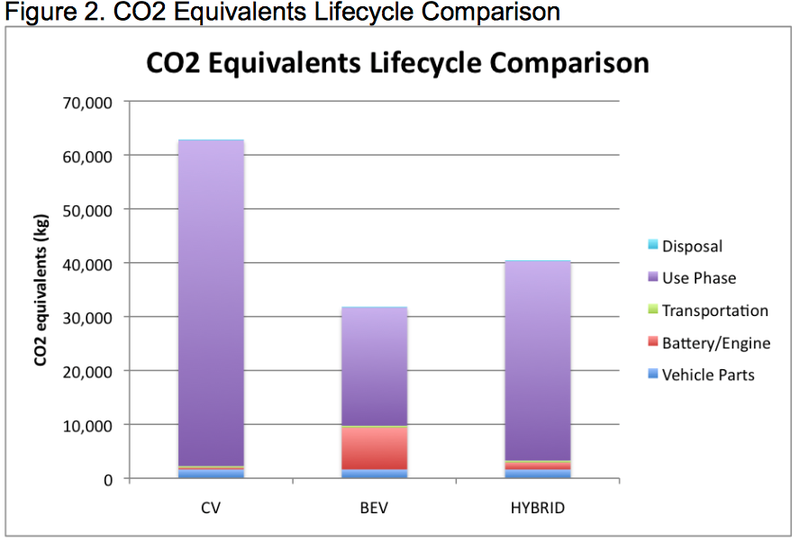 In terms of environmental impacts, the BEV was determined to have the least overall impact, followed by the hybrid, and lastly the CV. Here is a chart from that report showing the life cycle impacts using California's electric grid fuel mix [coal (7%), nuclear (14%), natural gas (42%), total hydropower (13%), wind (5%), geothermal (5%), solar (0%), and biomass (2%)]. The Battery electric vehicle emits about half the CO2 of the conventional vehicle over its lifetime. The question specifically asks about the worst case for CO2 emissions - a country where most electricity comes from coal. This is also addressed in the CARB report, through the following figure which looks at different electricity mixes. The study used this mix for China: coal (79%), nuclear (2%), natural gas (2%), hydropower (16%), oil (2%), wind (0%), geothermal (0%), solar (6%), and biomass (0%). 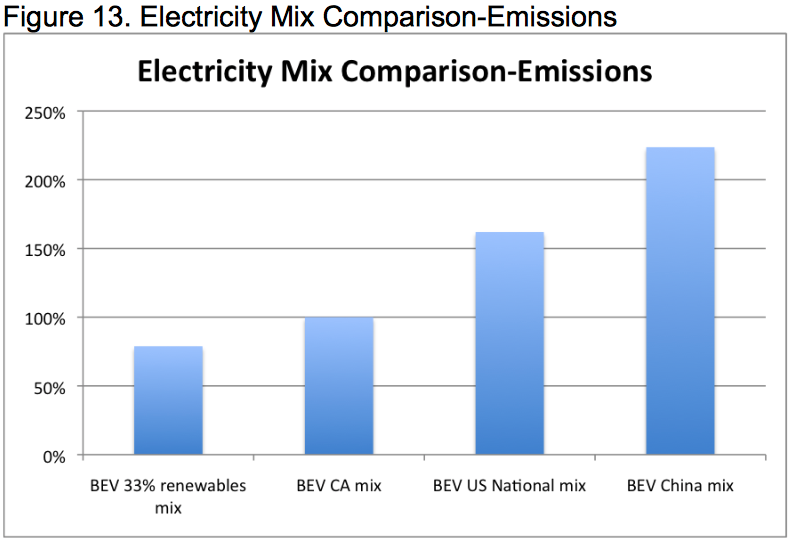 The BEV emissions from the China electric mix are about 2.25 times higher than for the California mix, which would put them at slightly higher than a conventional vehicle, based on the first figure. It is clear that the cradle-to-grave CO2 emissions are comparable to a conventional vehicle in the most coal-intensive electric grid, and considerably better as the percentage of coal drops. Given that the trend is toward less coal globally, it is clear that the situation will improve from here. We found that: (1) driving the average electric vehicle in any region of the country produces lower global warming emissions than the average new gasoline car achieving 29 MPG; (2) our ratings in 20 out of 26 regions have improved since our 2012 report; and (3) about 66 percent of Americans—up from 45 percent just three years ago—live in regions where power- ing an EV on the regional electricity grid produces lower global warming emissions than a 50 MPG gasoline car. An electric car uses around 250-300 Wh per mile (1,2) or 155-186 Wh/km. Let's be generous and assume 250 Wh per mile. Coal produces around 2.3 lb of Carbon Dioxide (CO2) per kWh (3) or about 1 kg/kWh. That means your electric car produces 250 g/mile or 155 g/km on average. Even a good petrol engine will beat this; a VW Golf BlueMotion Diesel gets 99 g/mile (4) or 62 g/km. However, it's not all bleak for electric cars. As an example, in the UK only uses 33% coal (5), so an electric car in the UK would only produce 83 g/mile or 52 g/km CO2, although other fuels produce CO2 as well, they produce it in smaller amounts. It will especially become more environmentally friendly as wind power and other renewable sources are used more. You also have to take into account the distribution of the fuel; after all, it has to be transported to the fuel station for you to fill up your car, and you have to drive to the fuel station in question, compared to electricity which loses minimal energy in the transmission process, and charging can be done at home. If you can install solar panels on your roof, then yes. If you're getting your power from the grid, then no. Keep in mind, that the solution to CO2 emissions isn't "should we make all cars electric, or should we replace all of our coal power plants", it's both. You can't say "Oh, well, electric cars are no good then" because your local electricity generators are too dirty. Both need to be replaced ASAP. Full stop. And as we do the work to replace the dirty power plants, we simultaneously make existing electric cars cleaner. No further work needs to be done. So let's stop complaining about how this solution or that solution isn't perfect, and get to work. Not the answer you're looking for? Browse other questions tagged environment road-vehicles energy . Is a car's fuel consumption increased when the headlights are on?